My name is Denis Byaruhanga . I work with Kompyuta Africa as a programmer. I got to know about API Courses through a friend. I did a short course in Project Planining and Management. 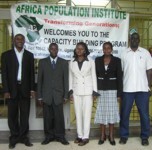 Africa Population Institute (API) is an institution of higher learning and transformation research to help Africa to achieve sustainable development. 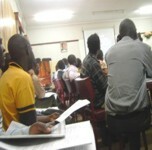 It deals with capacity building to enhance human resource performance. API has trained students from the 9 countries of Africa in tangible entrepreneurship, management and health skills It is licensed and accredited by the Uganda National Council for Higher Education under the Universities and Other Tertiary Institutions Act, Registration number TI.PL 0074. API now operates in 9 African countries with its regional outreaches whereby over four thousand (4000) nationals from Uganda, Kenya, Tanzania, Rwanda, Burundi, Southern Sudan, Somalia Republic, Democratic republic of Congo and Ethiopia have acquired special knowledge and skills in various practical and relevant fields through our capacity building program. The number of people in Africa has passed the one billion mark, the UN Population Fund says in a report.